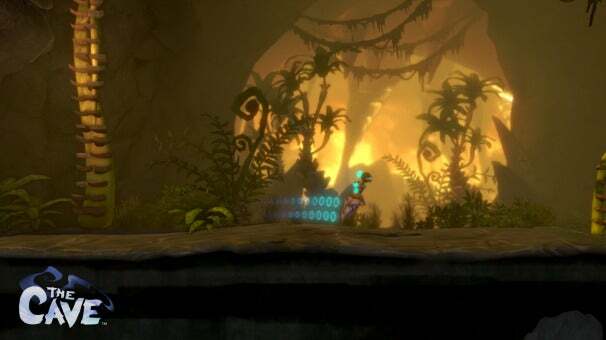 Double Fine, the game studio that brought you games such as Psychonauts and Brutal Legend, have announced a new adventure game called The Cave that the company plans to release early next year for PC, PS3, and Xbox 360. The Cave is the brainchild of Ron Gilbert, the man behind seminal adventure games like Maniac Mansion and The Secret of Monkey Island. We visited Double Fine HQ yesterday to get an early look at the game, and after watching Gilbert guide us through some basic gameplay it's clear that The Cave draws inspiration from Gilbert's earlier work on PC adventure games. 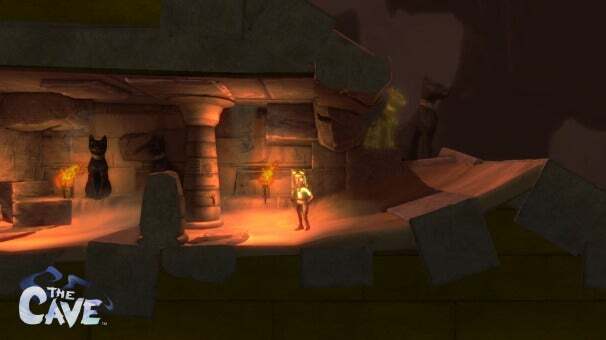 Like Maniac Mansion, Double Fine's The Cave will allow you to pick several characters from a roster of archetypes looking to explore a mysterious cave for their own personal quests. These characters include traditional protagonists like a knight and a scientist, but the roster is rounded out by stranger characters like a time traveler, a hillbilly, and a fairly creepy pair of twins. Each character has their own special abilities and their own storyline that will unfold while they explore the self-described (yes, the eponymous Cave talks to you) "mysterious and sultry" caverns. After introducing the game's characters and general premise, Gilbert narrated a short demo of the game itself. 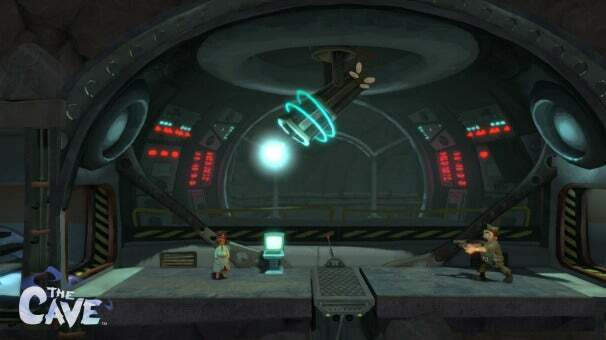 In action the game seems to control like a Metroid- or Castlevania-style platformer that's all about exploring odd environments, but the puzzle-solving segments were pure old school adventure gaming with Double-Fine's traditional bizarre sense of humor. One puzzle involved fixing a hot-dog vending machine to but a hot dog, then using said sausage to lure out a dangerous monster blocking your path before quickly activating a claw mechanism that captures the beast. 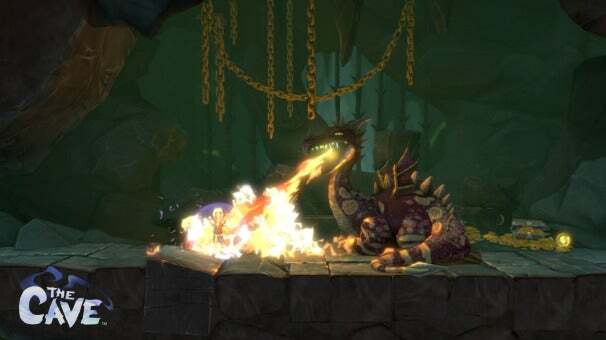 The short demo also saw players contending with a sleeping (but still dangerous) dragon in an area themed around the Knight before navigating past gates and other typical adventure gaming obstacles. 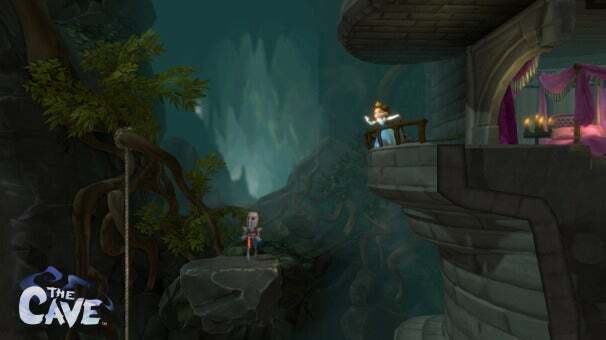 Since the game requires you to go spelunking with a custom team of three characters (though not all at once; you can switch between them at will), The Cave will support a local multiplayer option that allows friends to take over controlling the second and third characters whenever they're onscreen. If you wander off, there is no split-screen mode; The Cave will simply follow one character and drop control of the others until you come back to them or switch which character you're controlling. Gilbert mentioned that the Double Fine development team worked hard to make these transitions seem natural and seamless, but without any hands-on time with the game it was the one part of the demo that left me more skeptical than excited. 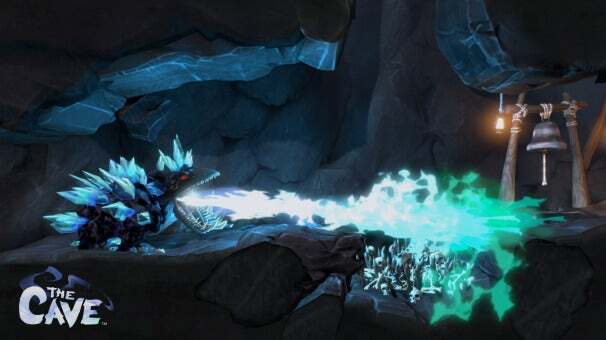 The Cave should not be confused with Double Fine Adventure, the company's other adventure game that raised over $3 million on Kickstarter earlier this year. 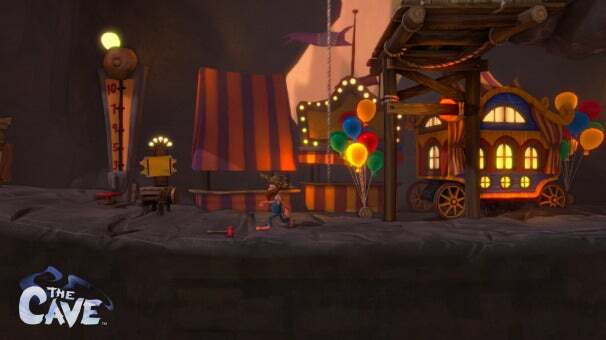 Double Fine Adventure is still in its infancy, while development of The Cave significantly predates Double Fine's crowd-funding campaign. 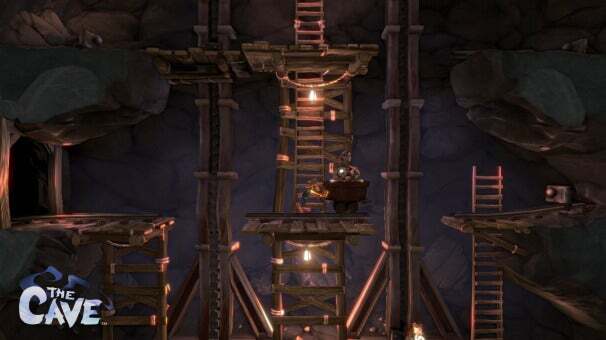 During our Q&A Gilbert claimed his team has been working on The Cave for about a year; the game will be published by SEGA and is expected to release in early 2013 on Xbox Live, the PlayStation Network and the PC (presumably via Steam). We'll have more information on the game as its release draws nigh; for now, have a look at a few more screenshots from The Cave.